The Telematics industry is becoming more transparent allowing fleet managers to efficiently track company fleet and gain engine diagnostic information and measure fleet productivity all using fleet management software. In today’s economy, companies are trying to reduce operating costs by any or all means. As one of the top business operating expense, fleet managers are under pressure to keep costs as lean as possible while continuing to maintain productivity. This often leads to keeping vehicles on the road for an extended period of time leading to a huge cost build-up in the long run. 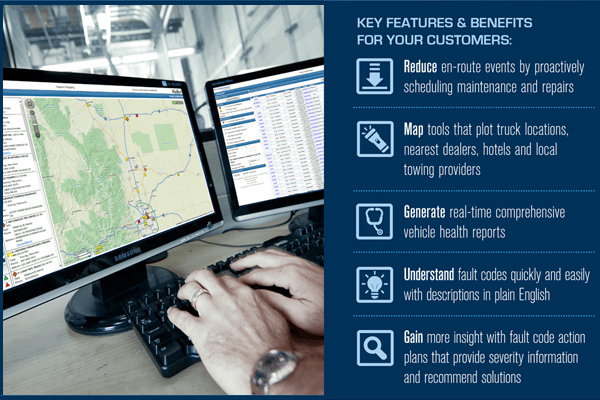 Company operations and profitability is most affected during vehicle downtime and to help fleet managers avoid make clouded decisions GoFleet has partnered with OnCommand Connection for engine diagnostic information and immediate maintenance. Basically, a partnership to help identify the potential problem beforehand, lower repair costs and eventually increase fleet uptime. Offering an effective fleet management program will help sales managers offer an all rounded service i.e. Vehicle + OnCommand Connection. This adds value to the dealership by providing customers with the ability to streamline their business. Oncommand Connect, Tracking, Dispatching, HOS/DVIR Compliance, Reefer Temp Monitoring, Fuel Card Integration and Work Form Programs. We help onboard new customers with their Fleet Management Program, enhancing purchasing experience. We help your customers understand how to save money and work with your dealership on service, ensuring they come back to you for future purchases. Maximizing service and providing the best customer experience can be especially challenging when you don’t have up to date information on the health of your vehicles. To learn more about OnCommand Connection contact us and we will be happy to discuss its benefits and features with you!